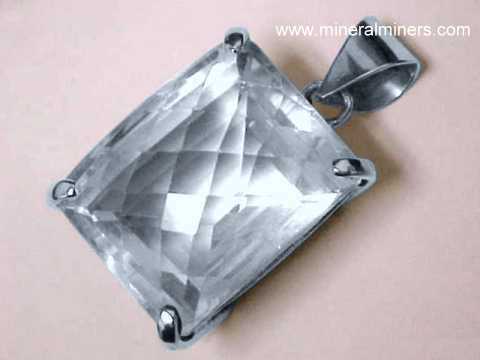 Try our Natural Quartz Crystals Satisfaction Guarantee - compare our prices and our superior quality. Select any natural quartz crystal image below to see a larger scale image. Quartz Crystal Cluster Dimensions: 3.2" long x 2.1" x 1.6"
This naturally terminated quartz crystal cluster has a few dozen quartz crystals with very little matrix. Most of the quartz crystal terminations are in excellent condition. Quartz Crystal Cluster Dimensions: 4.4" long x 2.7" x 1.6"
This naturally terminated quartz crystal cluster has more than 50 quartz crystals with very little matrix. Most of the quartz crystal terminations are in excellent condition. Quartz Crystal Cluster Dimensions: 4" long x 3" x 1.7"
This naturally terminated quartz crystal cluster has more than a dozen quartz crystals with very little matrix. The quartz crystal terminations are in excellent condition. This quartz crystal cluster measures 2" long x 1.7" x 1.4"
The crystal tips of this naturally terminated quartz crystal cluster are in very good condition. The quartz crystals are semi-transparent at their base and have very good transparency near the tips. This quartz crystal cluster measures 3.3" x 2.4" x 1.7"
The upright crystal tip of this naturally terminated quartz crystal cluster is in good condition. The quartz crystals have very good transparency. This quartz crystal cluster measures 3.8" x 3" x 1.6"
This naturally terminated quartz crystal cluster has several crystals that are cloudy at their base with very good transparency near the tips. Most of the crystal tips are slightly abraded. Quartz Crystal Specimen Dimensions: 3.8" x 3.4" x 1.3"
The prismatic faces and the tip of this naturally terminated quartz crystal specimen are in very good condition. It colorless with very good transparency. In the photo at left, the horizontal crystal is tabular and bi-terminated. 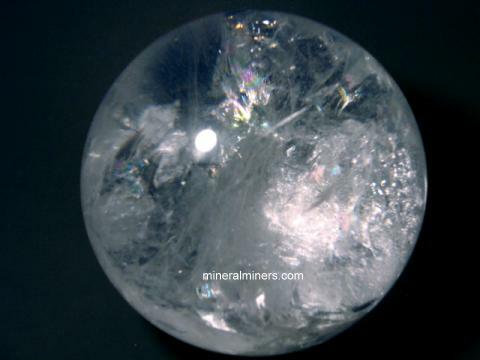 The bi-terminated quartz is slightly torqued as well. See also another view of this collector quality quartz crystal cluster. Quartz Crystal Specimen Dimensions: 4.2" x 1.7" x 1.3"
This collector quality crystal of natural colorless quartz has very fine transparency. 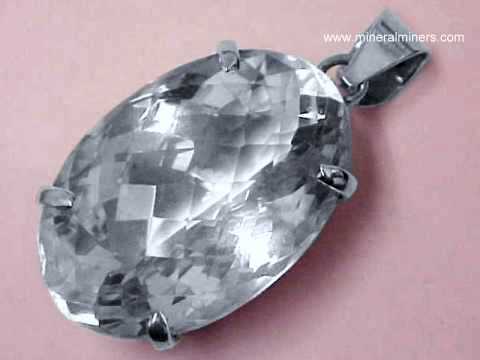 It is naturally terminated with prismatic faces & terminations in extra fine condition. See another view of this fine collector quality quartz crystal. Quartz Crystal Specimen Dimensions: 5.5" x 3.1" x 2.8"
This specimen of naturally terminated quartz crystal consists of two main intergrown quartz crystals. 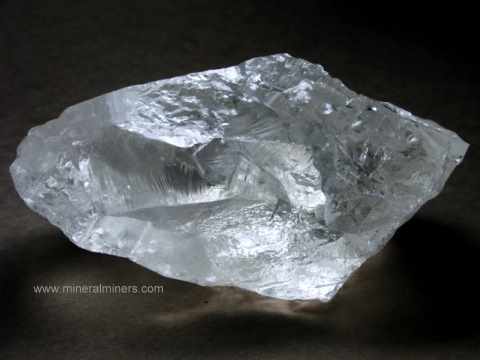 The larger crystal has very good transparency with natural terminations in good condition, while the smaller crystal has mostly broken surfaces. Both crystals have multi-color chlorite clay mineral inclusions inside in natural color shades of light purple, tan, green and white. 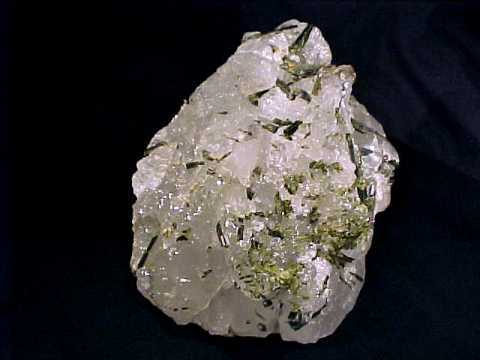 See also a full view of this natural specimen of quartz crystal with chlorite. Quartz Crystal Specimen Dimensions: 3.4" x 3.1" x 2.8"
This colorless quartz crystal specimen consists of a larger crystal inter-grown with two smaller quartz crystals. The lightly included quartz is transparent. The base was sawn flat and polished so that this quartz cluster stands up in the position shown. The re-cuperated tip is in very good condition. See a different side view of this quartz crystal cluster. 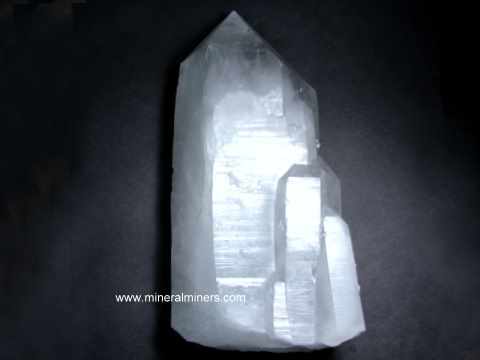 Quartz Crystal Dimensions: 6.7" x 1.5" x 1.1"
This naturally terminated quartz crystal is 6.7 inches long. The lightly included quartz is transparent. The prismatic faces and terminations are in very good condition. It has a slightly tapering shape. 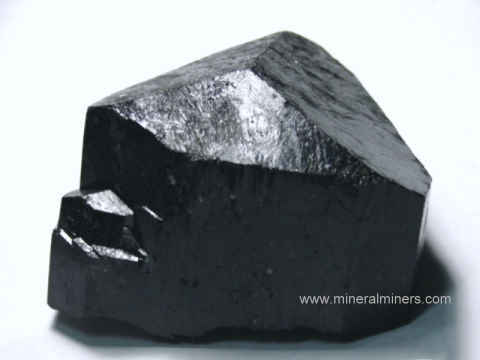 Crystals from this region in Brazil with tapering shapes are popularly known as Diamantina laser crystals. Quartz Crystal Cluster Dimensions: 4.7" long x 4" x 2.9"
This natural quartz crystal cluster has no matrix, the crystals are intergrown at their base. There are a few dozen of these naturally terminated quartz crystals, and most are partially to completely bi-terminated with natural terminations at their base as well as their tips. This quartz crystal specimen makes a very nice decorator quartz cluster. Most of the quartz crystal terminations are in very good condition. See also another view of this collector quality specimen of natural quartz crystals. Quartz Crystal Dimensions: 6.3" x 2.5" x 2"
This naturally terminated quartz crystal is transparent in the upper half and becomes semi-transparent towards its base. The prismatic faces and terminations are in mostly good condition with some minor abrasions. 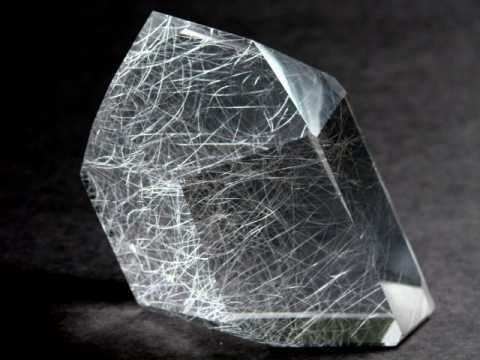 See an opposite side view of this quartz crystal. Quartz Crystal Cluster Dimensions: 8.5" long x 4.3" x 3.5"
This natural quartz crystal cluster has more than a hundred naturally terminated quartz crystals! This quartz crystal specimen makes a very nice decorator quartz cluster. Many of the quartz crystal terminations are in very good condition, some are broken. See also another view of this natural quartz crystal cluster. Quartz Crystal Cluster Dimensions: 5.7" long x 3.7" x 2"
This natural quartz crystal cluster has no matrix, the crystals are intergrown at their base. These naturally terminated quartz crystals are exceptionally clear! This quartz crystal specimen makes a very nice decorator quartz cluster. The quartz crystal terminations are in very good condition overall. This quartz crystal mineral specimen is 5.6" long x 3.2" x 1.8"
This rare quality naturally terminated quartz crystal cluster has a couple of large clear quartz crystals with several smaller crystals intergrown at their base. 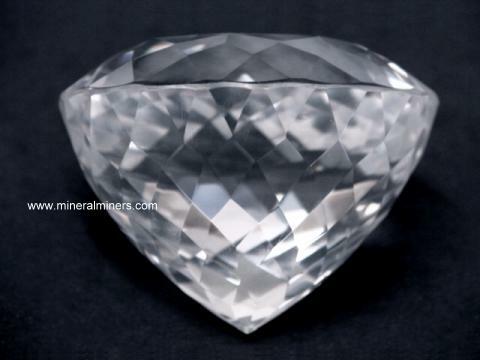 The tip of the largest crystal is in very good condition, and the other crystal tips show some minor abrasions. Quartz Crystal Cluster Dimensions: 6.7" long x 3" x 2.6"
This naturally terminated quartz crystal cluster has several large crystals. Most of the quartz crystal terminations are in good to very good condition. See also an opposite side view of this natural quartz crystal cluster. Quartz Crystal Cluster Dimensions: 8" long x 4.7" x 3.2"
This naturally terminated quartz crystal cluster has a few dozen quartz crystals. Some of the quartz crystals show minor abrasions. This quartz crystal specimen is a very nice decorator quartz cluster! Quartz Crystal Cluster Dimensions: 5.3" long x 4.5" x 3.5"
This naturally terminated quartz crystal cluster has more than a hundred quartz crystals. Most of the quartz crystal terminations are in very good condition. See also another view of this natural quartz cluster. This quartz crystal mineral specimen is 8.7" long x 3" x 2.5"
This naturally terminated quartz crystal cluster has a 7.5 inch long crystal with a couple of small crystals intergrown around its base. The crystals have very good transparency, and the tips are in very good condition! See also an opposite side view of this beautiful specimen of natural quartz crystals. Quartz Crystal Cluster Dimensions: 6.8" long x 6" x 4.2"
This naturally terminated quartz crystal cluster has more than a hundred quartz crystals! This quartz crystal specimen makes a very nice decorator quartz cluster. Most of the quartz crystal terminations are in good condition. See also another view of this natural quartz crystal cluster. Quartz Crystal Cluster Measurements: 6.3" long x 3.6" x 2.7"
This naturally terminated quartz cluster has about a dozen quartz crystals. The longest crystal measures 4 inches long. Many of the crystal tips in this naturally terminated quartz crystal cluster are in very good condition, some have minor abrasions. See another view of this natural quartz crystal cluster. Quartz Crystal Cluster Dimensions: 7.3" x 5" x 3.5"
Quartz Crystal Cluster Dimensions: 8.6" x 4" x 3"
This natural quartz crystal cluster has no matrix, the naturally terminated quartz crystals are intergrown at their bases. This quartz crystal specimen makes a very nice quartz crystal decorator cluster. The quartz crystal terminations are in very good condition overall with only a few minor abrasions. See also another view of this collector quality specimen of natural quartz crystal. This quartz crystal mineral specimen is 8.3" x 4.5" x 2.9"
This natural quartz crystal cluster has a very large crystal measuring 8 inches long! The crystals have very good transparency. 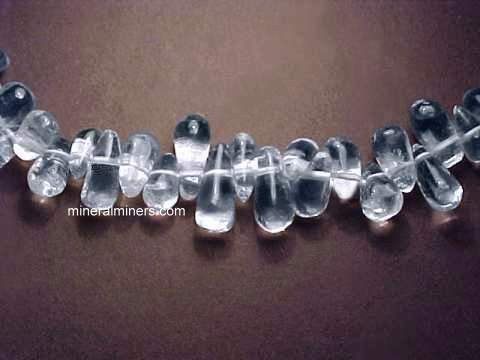 See an opposite side view of these beautiful quartz crystals. See also another view of this unique decorator quartz crystal specimen. Quartz Crystal Measurements: 5.1" long x 3.6" x 2.7"
The upper 70% of this fine collector quality quartz crystal has very good transparency. This naturally terminated quartz crystal begins as one crystal and formed additional crystal tips farther up the crystal. Natural quartz crystals with this form are known as cathedral quartz. 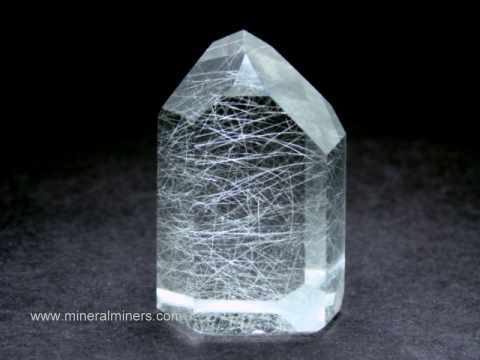 The prismatic faces and terminations on this naturally terminated quartz crystal are in very good overall condition, and they show very interesting naturally etched surface features. See a side view of this cathedral quartz crystal. See also an opposite side view of this wonderful cathedral quartz crystal. Quartz Crystal Cluster Measurements: 8.7" long x 4.8" x 2.7"
The crystal tips in this decorator quartz crystal cluster are in very good condition overall. There are several bi-terminated quartz crystals. The crystals are mostly transparent with no matrix. 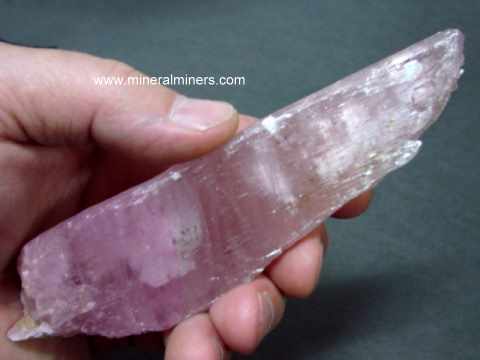 The largest crystal measures about 8.7 inches long! This quartz crystal mineral specimen is 7" long x 6" x 5.3"
This naturally terminated quartz crystal cluster has over one hundred crystals! Several of the crystals are bi-terminated. The crystal tips have very good transparency, and most of the tips are in very good condition. See also an opposite side view of this beautiful quartz crystal cluster. This quartz crystal mineral specimen is 7.7" long x 6" x 4.5"
This natural quartz crystal cluster makes a very attractive decorator specimen. The crystal tips have very good transparency, and most of the tips are in good condition. See also an additional view of this beautiful quartz crystal cluster. This natural quartz crystal specimen measures 10.2" long x 5.3" x 4"
This naturally terminated quartz crystal is translucent to semi-transparent and becomes transparent near the tip. The faces and terminations are in good overall condition with some abraded areas. Quartz crystals of this type are popularly referred to as a quartz generators or generator crystals. This beautiful specimen of natural quartz stands up nicely on one of our 6 inch pillow stands. See also a side view of this quartz decorator crystal. This natural quartz crystal decorator specimen measures 10.2" long x 6.5" x 5.7"
This naturally terminated quartz crystal decorator specimen is actually composed of two large intergrown crystals with very fine quality natural terminations! There also are a few small intergrown quartz crystals as well. 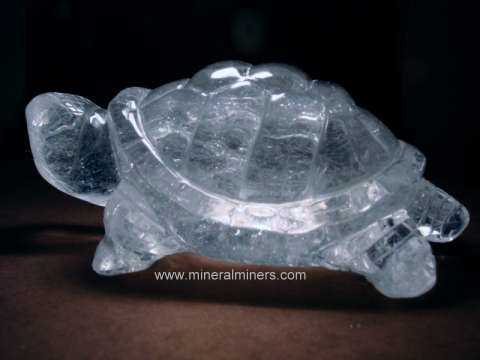 See a backside view of this natural quartz crystal decorator specimen. 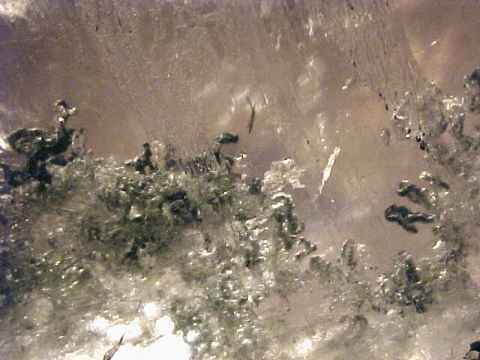 The upper part of the two large intergrown crystals has good transparency, and they become cloudy towards their base. 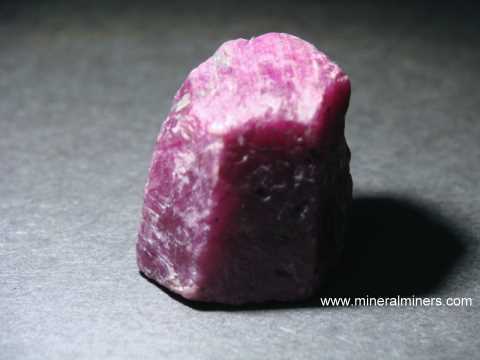 The naturally terminated tips of the two main crystals are in excellent condition! See a close-up view showing the intergrown tips of these two large intergrown quartz crystals. Most of the prismatic faces and other surfaces are in excellent condition as well with some abraded areas. Quartz Crystal Specimen Dimensions: 6" tall x 5.5" x 4.5"
This colorless quartz crystal decorator specimen looks great from all sides. 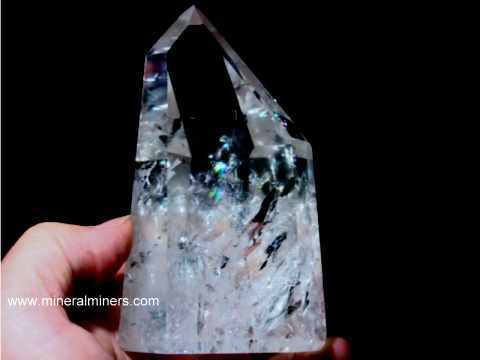 The largest quartz crystal is 7 inches long and has brown and white chlorite mineral inclusions inside and a small natural triangular record keeper on one of its terminations as shown at left. The lightly included quartz crystals are transparent. This unique quartz crystal cluster stands up in the position shown in the linked full view image of this beautiful quartz crystal cluster. See also a side view of this wonderful quartz crystal cluster. Quartz Crystal Specimen Dimensions: 6.7"tall x 4.8" x 3.9"
This colorless quartz crystal decorator specimen looks great from all sides. It consists of a large quartz crystal inter-grown with three more quartz crystals. The lightly included quartz is transparent. This beautiful decorator quartz cluster stands up in the position shown. The re-cuperated tip is in very good condition. See a different side view of this large quartz crystal cluster. This large decorator cluster has several dozen quartz crystals with very good transparency at the crystal tips. Most of the crystal tips in this quartz crystal decorator specimen are in very good condition, some tips are broken or abraded. See a different side view of this large quartz cluster. This large decorator cluster has hundreds of natural quartz crystals with very good transparency at the crystal tips. Most of the crystal tips in this quartz crystal decorator specimen are in very good condition, some crystals are broken or abraded. The largest crystals are over 5 inches long. 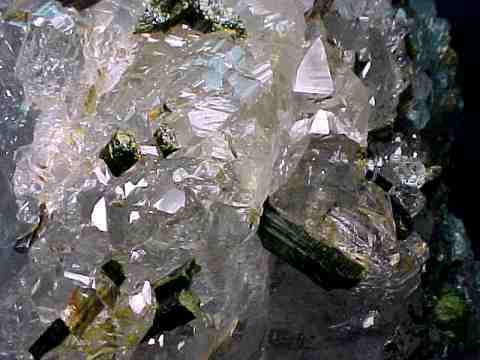 In one area some of the quartz crystals have natural multi-color chlorite clay inclusions. See a close-up view showing a 4.5 inch long quartz crystal with green, white and brown chlorite inclusions in quartz. This beautiful quartz crystal cluster has hundreds of natural quartz crystals with very good transparency at the crystal tips. Most of the crystal tips in this quartz crystal decorator specimen are in very good condition, some crystals are broken or abraded. The largest crystal is over 5 inches long. See another view of this wonderful large quartz crystal cluster. This large decorator cluster has hundreds of quartz crystals with very good transparency at the crystal tips. 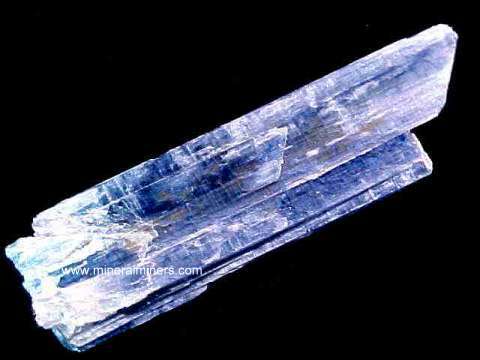 The longest crystals measure about 4 inches long. 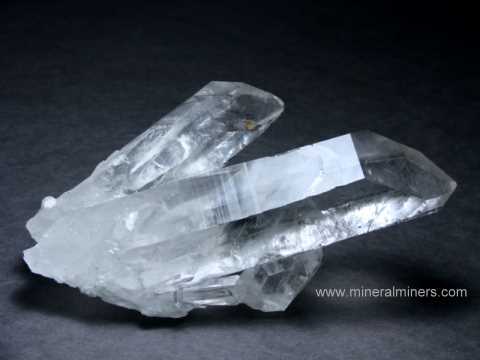 Most of the crystal tips in this naturally terminated quartz crystal decorator specimen are in very good overall condition, some crystals are broken or abraded. See also a full-view photo of this large decorator quartz crystal cluster. This quartz crystal mineral specimen is 8" x 7" x 6.5"
This rare quality quartz crystal cluster has dozens of intergrown crystals with several 5 inch long water clear quartz crystals as well. The crystal tips are in very good condition overall. See another view of this large quartz crystal cluster. Quartz Crystal Specimen Dimensions: 8.8" tall x 7" x 5"
This colorless quartz crystal decorator cluster looks great from all sides, and it stands up naturally in the position shown. 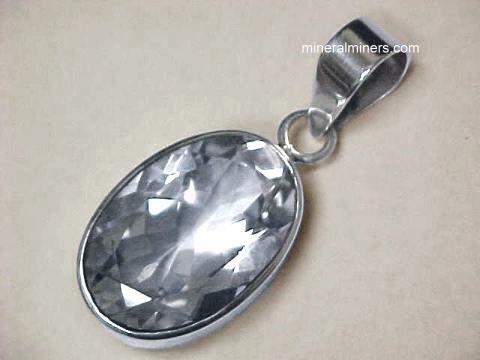 It consists of two large quartz crystals with several dozen small quartz crystals. The largest crystal is 8.5 inches long! The re-cuperated tips are in excellent condition. See a side view of these beautiful quartz crystals. See also an opposite side view of this fine quality quartz crystal cluster. Quartz Crystal Specimen Dimensions: 7.7" x 7" x 5"
This colorless quartz crystal cluster makes beautiful decorator mineral specimen! The largest crystal is over 6 inches long. The re-cuperated tips are in very good condition. See another view of this beautiful quartz crystal cluster. Quartz Crystal Specimen Dimensions: 9.7" x 6.5" x 5.7"
This colorless quartz crystal cluster makes a wonderful decorator mineral specimen! 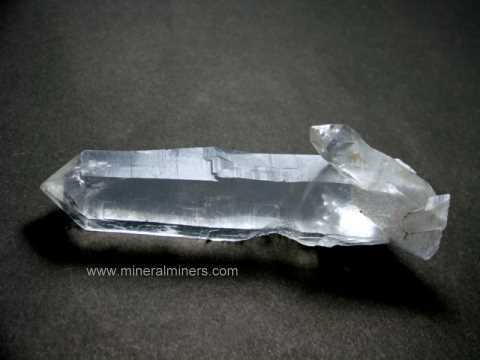 The largest crystal is 9 inches long, and the tips are in very good condition. See an opposite side view of this amazing quartz crystal cluster. Quartz Crystal Specimen Dimensions: 14.5" x 8" x 6.5"
This colorless quartz crystal cluster makes a fantastic decorator mineral specimen! 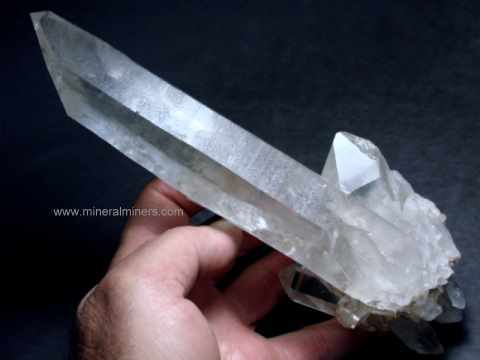 The largest crystal is 10 inches long, and the tips are in very good condition. 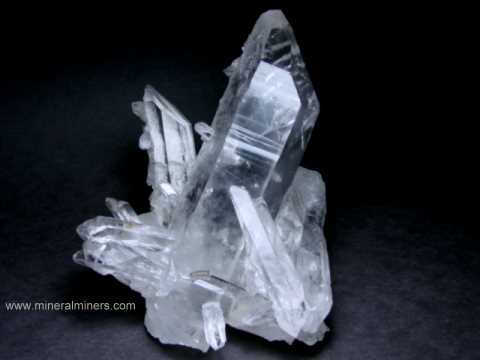 See an opposite side view of this wonderful quartz crystal cluster. See a top view of this collector quality quartz crystal cluster. This slender crystal was polished from a natural elestial quartz crystal mined at Diamantina, Brazil. It has excellent transparency and stands up as shown. Quartz Crystal Dimensions: 4.1" tall x 3.3" wide x 2.4"
This lightly included quartz crystal has some natural color dark green chlorite inclusions inside as shown in the close-up photo at left. 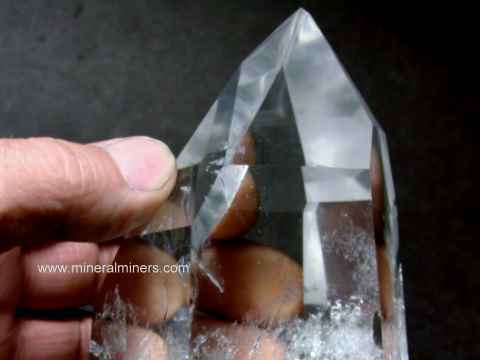 See a full view of this polished quartz crystal. This unique crystal was polished from a natural quartz crystal mined near Diamantina in Minas Gerais, Brazil. See also an opposite side view of this polished quartz crystal. Quartz Crystal Dimensions: 3.5" tall x 3.2" wide x 2.7"
This lightly included quartz crystal has light brown natural color with several internal rainbow reflections. This unique crystal was polished from a natural quartz crystal mined near Diamantina in Minas Gerais, Brazil. 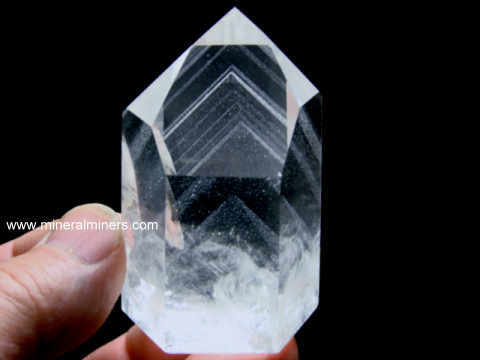 This polished decorator quartz crystal weighs 2.1 pounds. 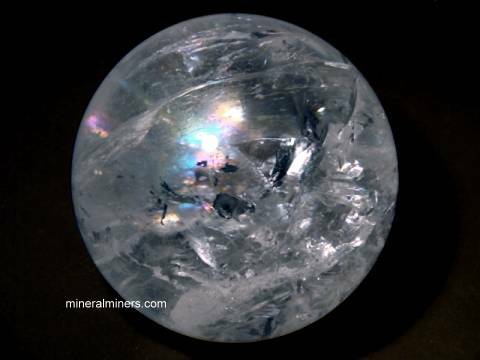 The quartz crystal is semi-transparent and colorless. It glows very well when placed on a light box. This quartz crystal was polished from a natural quartz crystal mined in Minas Gerais, Brazil. This polished quartz decorator crystal is semi-transparent and colorless. It glows nicely when placed on a light box. This quartz crystal was polished from a natural quartz crystal mined in Minas Gerais, Brazil. See another view of this large quartz crystal. This polished quartz crystal stands 3.9 inches tall. This unique quartz crystal is mostly transparent and it is slightly more cloudy around its base. 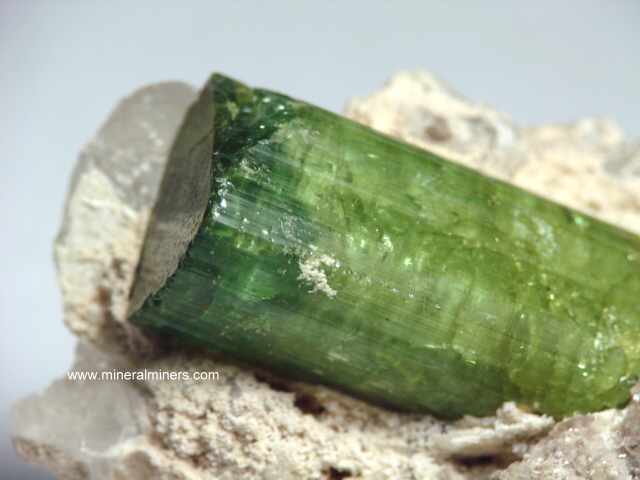 It has natural green chlorite phantom layers inside. 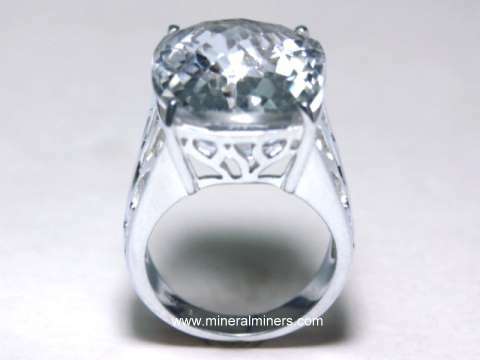 It was polished from a natural quartz crystal mined near Diamantina in Minas Gerais, Brazil. This polished quartz crystal stands 5 inches tall. This unique crystal is mostly transparent and it has natural green and purple chlorite phantom layers inside. There also is an internal rainbow reflection. 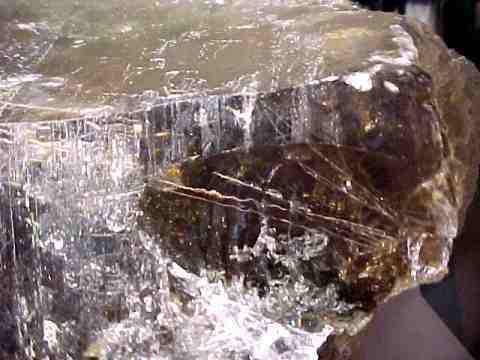 See a side view image of this quartz with chlorite crystal. 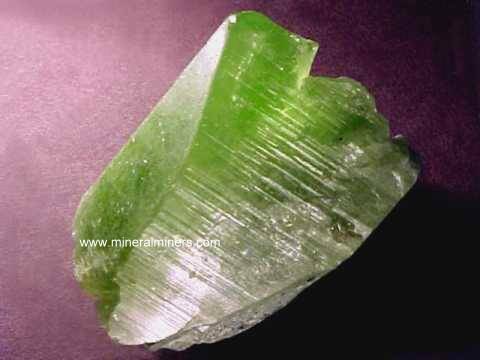 See also a back view image of this quartz crystal with chlorite. This polished quartz crystal stands 6.7 inches tall in its custom made wood stand. 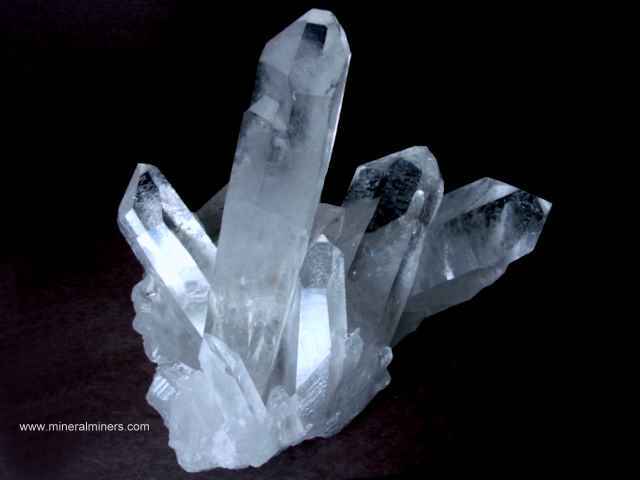 The quartz crystal is transparent throughout its length. 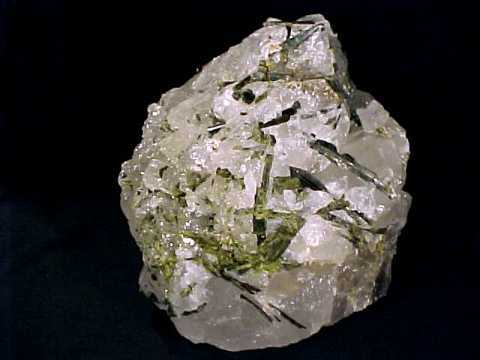 This unique crystal has faint green chlorite phantom layers within it. It was polished from a natural quartz crystal mined near Diamantina in Minas Gerais, Brazil. See also a full view image of this decorator quartz crystal in its custom wooden base. Quartz Crystal Dimensions: 6.2" tall x 5" wide x 3.7"
This decorator quartz crystal was polished from a natural quartz crystal unearthed near Diamantina in Minas Gerais, Brazil. This large quartz crystal is mostly transparent with some wonderful rainbow reflections inside. See also a side view photo of this large quartz crystal specimen. This decorator quartz crystal also looks fantastic on a light box! Golden Quartz Crystal Stands 7" tall x 4.3" wide x 2.7"
This polished elestial quartz crystal has pale golden natural color as shown (natural color light citrine). It was polished from a natural elestial quartz crystal mined in Minas Gerais, Brazil. It is mostly transparent with some beautiful internal rainbow reflections. This polished quartz decorator crystal stands 8 inches tall. The quartz crystal is semi-transparent to transparent. It looks fantastic on a light box! 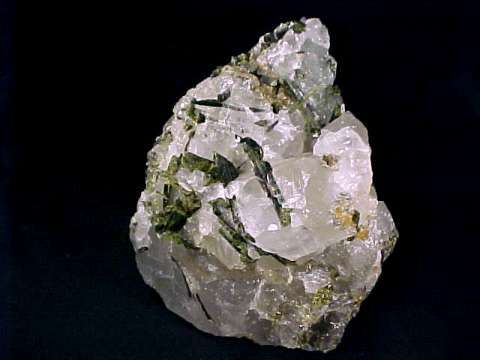 This unique crystal has faint chlorite phantom layers within the upper half of the crystal. It was polished from a natural quartz crystal mined in Minas Gerais, Brazil. 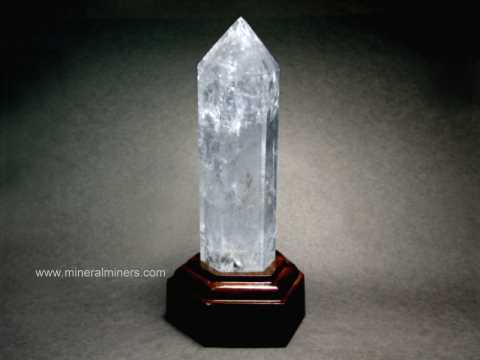 This polished decorator quartz crystal stands 9.6 inches tall and weighs 13.6 pounds. The quartz crystal is semi-transparent to transparent. It looks wonderful on a light box! 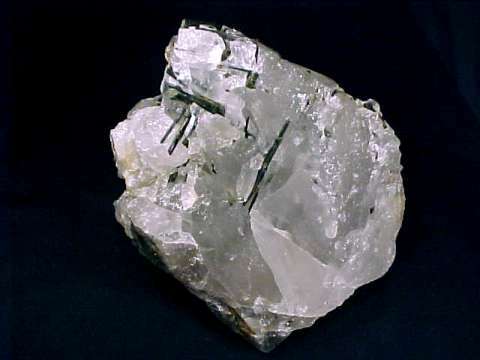 This unique crystal has chlorite phantom layers within the upper half of the crystal. It was polished from a natural quartz crystal mined in Minas Gerais, Brazil. 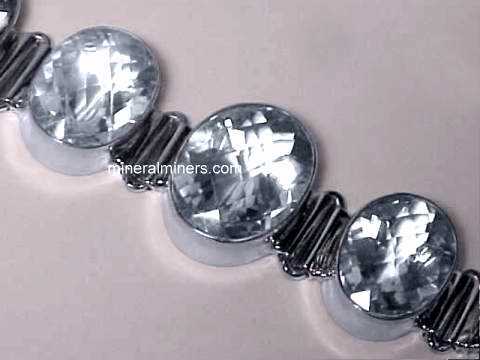 See a side view of this large decorator quartz crystal. See also a back view of this large decorator quartz crystal. 21" tall with wood base! This polished quartz crystal stands up 21 inches with its wood base. It was polished from a natural quartz crystal mined in Minas Gerais, Brazil. 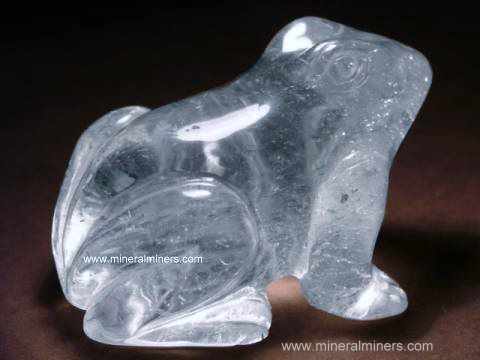 It is semi-transparent and mostly cloudy throughout its length with some increasing transparency near the tip. This fine quality polished quartz crystal has pale golden natural color as shown (natural color light citrine). It was polished from a natural elestial quartz crystal mined in Minas Gerais, Brazil. It is mostly transparent with some beautiful internal rainbow reflections. 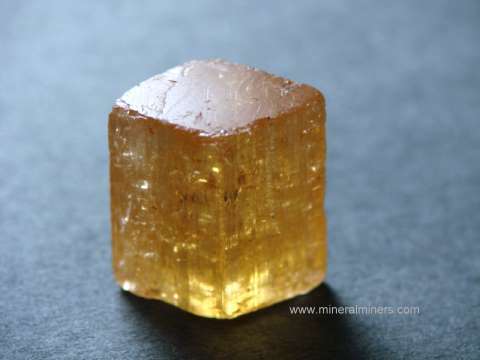 See an opposite side view of this natural color golden elestial crystal. 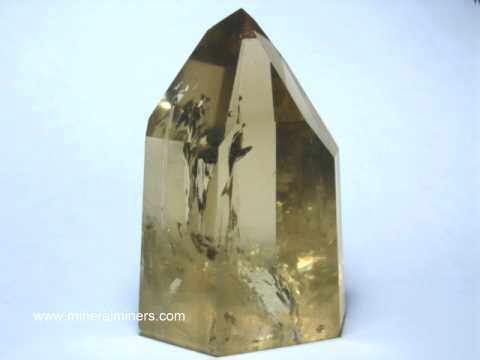 See also a side view photo of this beautiful golden elestial quartz crystal. stands up 15.8" tall x 5" x 3.7"
This polished quartz crystal weighs 19.9 pounds, and it stands up 15.8 inches tall as shown. It was polished from a natural quartz crystal mined in Minas Gerais, Brazil. 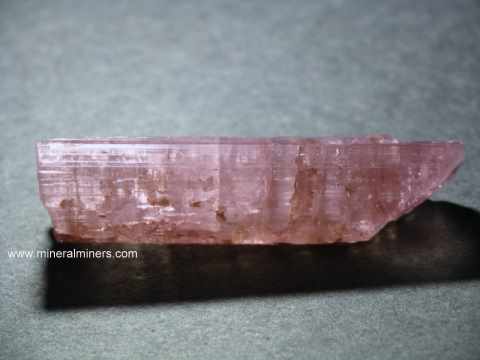 You can see from 1-2 inches into the quartz crystal throughout its length with increasing transparency near the tip where there is an orange iron-oxide inclusion in the otherwise colorless quartz. See a close-up view of the tip of this large quartz crystal. 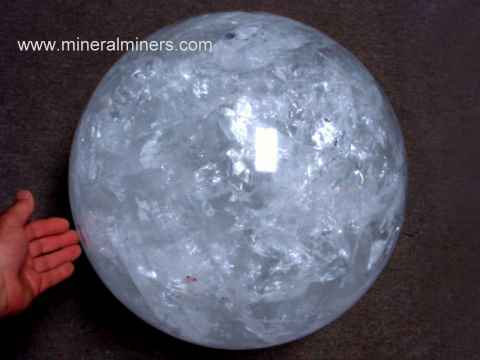 Large Polished Quartz Crystal, 110 pounds! This large quartz crystal weighs 110.6 pounds, and it stands up 23 inches tall as shown! It was polished from a natural quartz crystal mined in Minas Gerais, Brazil. This large size quartz crystal is semi-transparent at its base and has increasing transparency toward the tip. Near the tip, you can just see your hand moving on the opposite side of the crystal when looking through it. 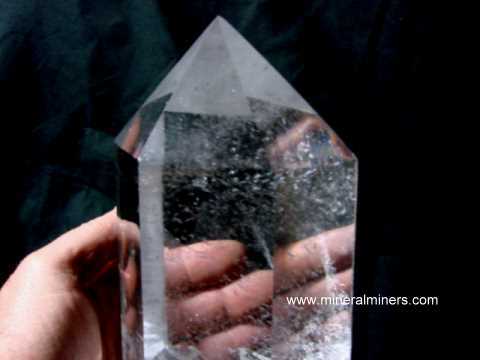 This beautiful quartz crystal specimen stands 12 inches. The upper half of this large polished crystal has very good transparency with some nice internal rainbow reflections. 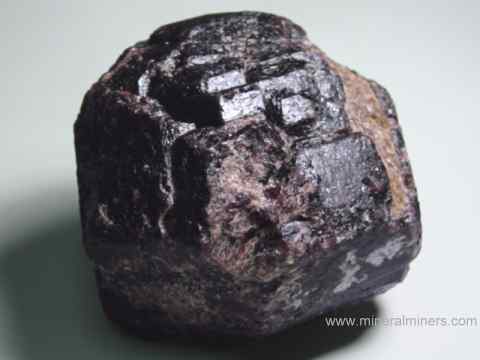 There also is a natural red hematite inclusion as shown in the lower-right area of the photo at left. 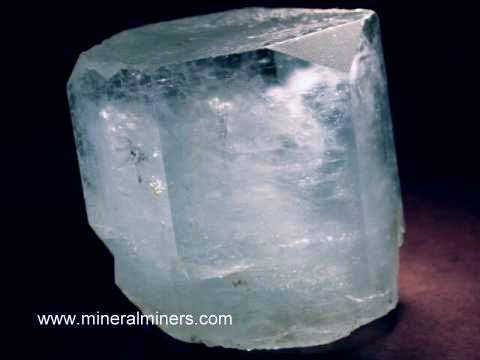 See also a full view image of this large large quartz crystal. This unique crystal was polished from a natural quartz crystal mined in Minas Gerais, Brazil. 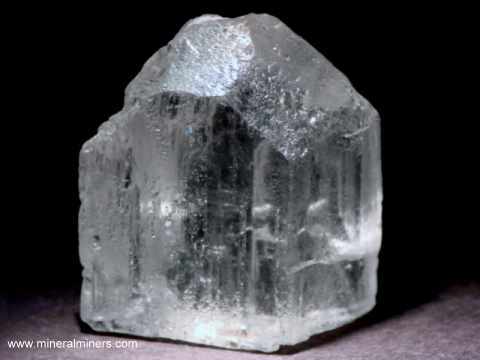 See a side view image of this wonderful quartz crystal. See also another side view of this large decorator quartz crystal. These superior grade polished quartz crystals were handground & polished from natural quartz crystals that were mined In Minas Gerais, Brazil. These crystals have very good transparency and measure 2 to 3 times as tall as their width. They are perfect for feng shui use, and they also make nice gifts for home or office decoration! 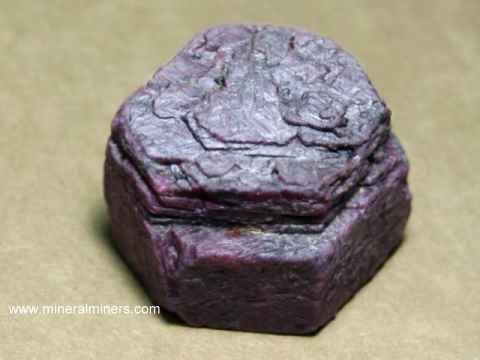 These small crystals also are very popular for metaphysical purposes, and they fit very comfortably in your hand. We have 3 sizes available at specially discounted volume prices: 1.9 to 2.1 inches tall, 2.2 to 2.5 inches tall and 2.6 to 3.0 inches tall. Please see below for prices, quantities, and ordering. 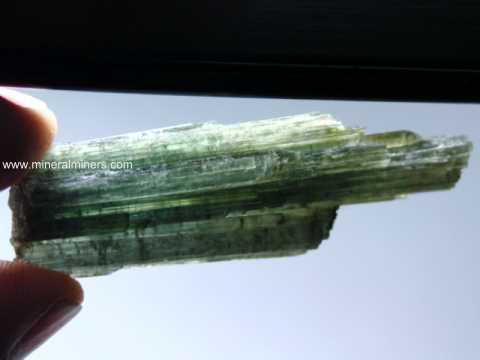 Epidote Crystal dimensions: 12" x 11.5" x 10.5"
This spectacular decorator specimen of epidote crystals on quartz has dozens of dark green epidote crystals both on the surface and passing through the beautiful semi-transparent to transparent quartz crystal. 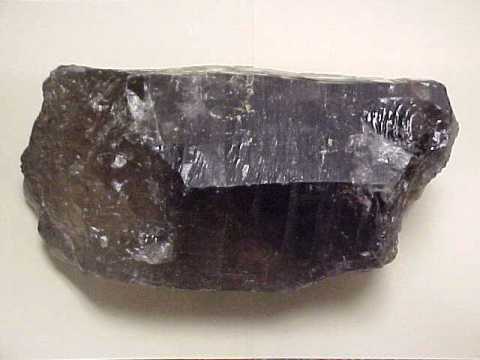 The largest of the epidote crystals measures 6 inches long. We have several different views available for this amazing specimen: front-view, left side view, right side view. See also another close-up view, and a back view. This is a truly spectacular decorator mineral specimen. 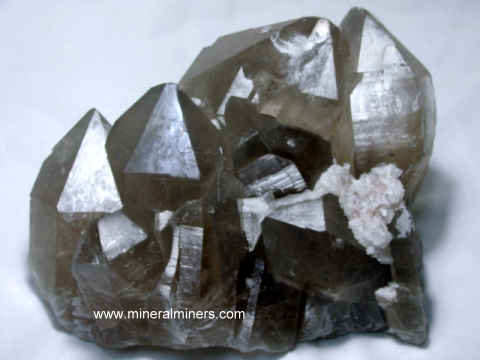 Our Quartz Crystals & Quartz Crystal Clusters were all mined in Brazil. All of our quartz crystals are 100% natural quartz crystal that crystallized inside the earth. We don't have any man-made quartz, and we don't have any re-constituted quartz crystal. We have many kinds of handcrafted natural quartz crystal items in stock including quartz crystal gemstones in a variety of shapes and sizes including extra large collector quartz gemstones. We also have a collection of very rare quality phantom quartz crystals and some amazing very clear polished lemurian quartz crystals. See also our quartz spheres (crystal balls) and other handcrafted quartz crystal items like quartz crystal pyramids. 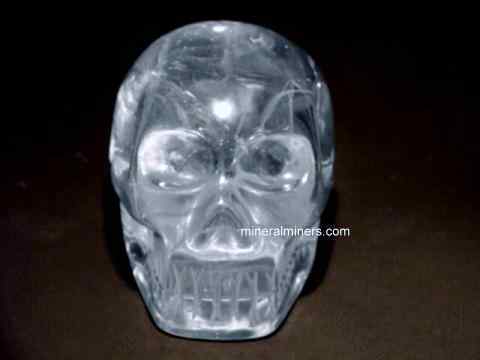 We have some amazing handcarved quartz crystal items including animal carvings & quartz crystal skulls. Natural quartz crystal forms within the earth under many different types of geological conditions, and there are many different types of natural quartz crystals. We have a huge inventory of natural quartz items in stock, over 45 tons! Our natural quartz crystals are available in a variety of shapes and sizes, including rare large size quartz crystals weighing hundreds of pounds each! See also our polished phantom quartz crystals which have been base-sawn and then polished on all surfaces, and our natural pink lemurian quartz crystals. 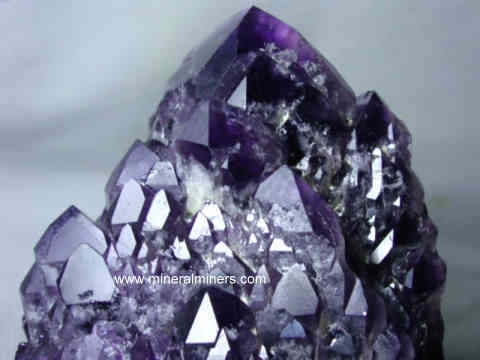 Be sure to see our polished amethyst crystals. We have a variety of shapes and sizes available in natural quartz crystal gemstones that have been set into handcrafted quartz jewelry designs in pendants, earrings, necklaces, rings, and bracelets. To see photos of another mineral variety, follow any link from our Mineral Inventory & Factsheet Index. 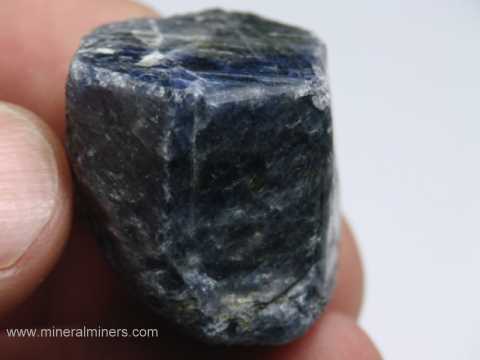 We have been mining professionally for quartz crystals, aquamarine crystals, citrine crystals, kunzite crystals, topaz crystals, kyanite crystals and other gems & minerals for more than 30 years! We have a very large variety of natural crystals available in many different minerals, including naturally terminated crystals of many different pegmatite minerals (some in matrix). Would you like to be informed by email when we add more when we add more natural quartz crystal clusters & quartz crystals on our website? We do have additional inventory of natural quartz crystals and quartz crystal clusters in stock in all sizes including quartz crystals over 500 pounds each at our mineral warehouses, so be sure to let us know if you have any quartz crystal requests. 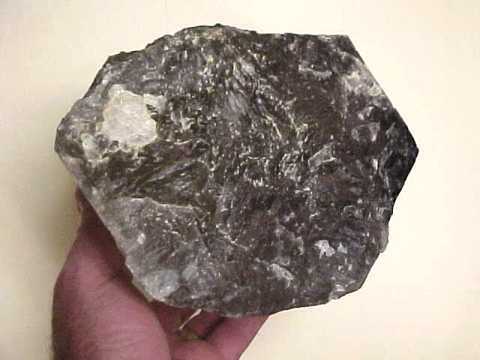 Please contact our webmaster or our 'site' geologist with any questions or comments regarding natural quartz crystals.